VSS Unity/VMS Eve take to the skies for Virgin Galactic’s first Spaceflight Dec. 14. The Mojave Air and Space Port, also known as the Civilian Aerospace Test Center, is located in Mojave, Calif. It is the first facility to be licensed in the United States for horizontal launches of reusable spacecraft, being certified as a spaceport by the Federal Aviation Administration on June 17, 2004. The facility covers 2,998 acres and contains three runways. Many aircraft and aerospace ‘firsts’ have happened at Mojave, and the air and spaceport continues to build on its legacy. Virgin Galactic is a spaceflight company within the Virgin Group that is developing commercial spacecraft and aims to provide suborbital spaceflights to space tourists and suborbital launches for space science missions. Virgin Galactic plans to provide orbital human spaceflights as well. SpaceShipTwo, Virgin Galactic’s suborbital spacecraft, is air launched from beneath a carrier airplane known as White Knight Two. On Dec. 14, 2018, the Virgin Galactic’s SpaceShipTwo, VSS Unity, landed from her maiden flight into space. The landing was met with cheers from Sir Richard Branson, and the teams form Virgin Galactic and The Spaceship Company. In January of this year, however, Virgin Galactic announced it was laying off about 40 people from its facilities at the Mojave Air and Space Port. The layoffs are part of a realignment in the company’s workforce as it starts to move operations to Spaceport America in New Mexico. In a statement to SpaceNews, the company said, “Recently we separated a small number of our team in order to position our organization for the drive to commercial operations following our successful recent spaceflight, and make room for new skill sets that we need to bring in over the course of this year.” The layoffs are not expected to impact the continued testing of SpaceShipTwo and the next flight is scheduled for some time in the coming weeks. Company founder Sir Richard Branson said in a television interview Jan. 24 that he expects commercial flights to begin in the middle of 2019. The Spaceship Company is a British/American spacecraft manufacturing company that was founded by Burt Rutan and Richard Branson in mid-2005 and was jointly owned by Virgin Group (70 percent) and Scaled Composites (30 percent) until 2012, when Virgin Galactic became the sole owner. TSC was formed to own the technology created by Scaled for Virgin Galactic’s Virgin SpaceShip program. This includes developments on the care-free reentry system and cantilevered-hybrid rocket motor, licensed from Paul Allen and Burt Rutan’s Mojave Aerospace. The company is manufacturing Virgin Galactic’s spacecraft and will sell spacecraft to other buyers. The suborbital launch system offered will include the SpaceShipTwo spacecraft and the White Knight Two carrier aircraft. The Stratolaunch aircraft undergoes a taxi test at the Mojave Air and Space Port. 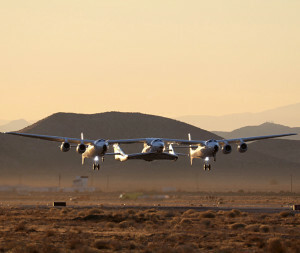 Stratolaunch Systems, founded in 2010 as a collaboration between Burt Rutan and the late Microsoft co-founder Paul G. Allen, operates from the Mojave Air and Space Port. The 385-foot-wide, twin-fuselage Stratolaunch aircraft — designed to serve as flying launch pad for rockets — has been undergoing high-speed taxi tests as a precursor to its first flight at Mojave. That first flight is expected sometime early this year. 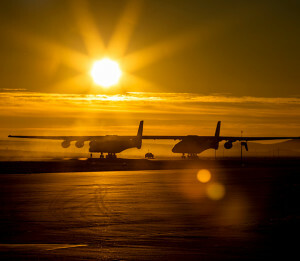 The company announced in January 2019 that, while it would continue work on the world’s largest aircraft, it is discontinuing its programs to develop a new type of rocket engine and a new line of rockets. It is not clear at this time, however, how the layoffs will affect the company’s timeline or business plan. ASB Avionics has been serving the air transport, corporate, military and general aviation avionics industry since 1991, and has the experience, products, accreditation and facilities to meet and exceed customers’ needs for avionics repair, retrofits, fabrication installations and more. The company provides custom engineering and installation of TCAS, Mode-S Transponder, GPS/FMS Equipment, Flat Panel Displays, EFIS, EGPWS, TAWS, Laser Navigation & Reference systems, Satcom systems, and many more. They represent of major avionics manufacturers such as Rockwell Collins, Honeywell, Goodrich, Trimble Navigation, Universal Avionics, and many more. ASB Avionics maintains a 39,000-square foot hangar facility at the Mojave Air and Space Port and their facility incorporates an engineering department, state of the art fabrication and bench repair shops, a sheet metal shop, and customer representative office space. Since 1981, Flight Research Inc., has been a leading provider of training, services and support activities which advance the safety and capability of the aerospace industry. Operating in three areas — training, flight test and support — the company has a 924,000-square foot facility at the Mojave Air and Space Port. Training: Flight Research provides upset training in all types of aircraft, spaceflight training for industry professionals and tourists, and custom training on request. Flight test: Flight Research is an industry leader in professional flight testing since 1981. Services include full airframe testing, UAS testing and component testing. Support: The Flight Research 145 Repair Station has experience with piston and turbine airframes, helicopter and fixed-wing category, and extensive experience with experimental aircraft. Flight Test Aerospace, Inc., founded in 1998, is a systems integrator providing mission-critical aviation services for government and commercial customers at the Mojave Air and Space Port. It offers aviation systems engineering and aircraft maintenance, repair, overhaul, and modifications, which include designing, integrating and manufacturing systems to initialize and drop radiosondes, receive data from radiosondes, and retransmit data to ground control stations; developing and testing payload packages for UAVs; and developing tactical situation display for counter-drug operations and use with APS-144 radars. The company also provides logistics and global supply chain management services for aircraft parts, vehicles, maintenance support packages, NVG equipment, tactical communications gear, petroleum, and oil and lubricants. In addition, it offers airlift operations in the areas of heavy lift, passenger transportation, cargo transportation, disaster relief, wreck salvaging, fire fighting, and search and rescue. The company provides its solutions in the United States, Afghanistan, Pakistan, Kazakhstan, Russia, Lithuania, and Mexico. The company has a strategic partnership with Prüst Holding B.V.
Interorbital Systems is a rocket, satellite and spacecraft manufacturing company and launch-service provider founded in 1996 by Roderick and Randa Milliron. Interorbital’s innovative modular launch vehicle, the NEPTUNE, is poised to provide the world’s lowest-cost access to space. Combined with IOS’ STEM products, the TubeSat and CubeSat Personal Satellite Kits, IOS is committed to providing reliable and affordable space-launch solutions. Interorbital’s NEPTUNE series modular launch vehicles are built from one or more Common Propulsion Modules, or CPMs, connected in parallel with optional tandem upper stages. Once a space mission’s requirements are specified, the launch vehicle can be custom-built for the mission by varying the number of CPMs and tandem upper stages. Since the Common Propulsion Modules have fewer systems than standard launch vehicles, they can be rapidly built on an an assembly line. Since the CPMs are all identical, the modular rockets can be assembled with efficient, standardized assembly techniques. In June 2018, Interorbital Systems’ rocket team successfully completed a low-altitude flight-test of its orbital vehicle’s liquid upper-stage rocket engine. The engine was integrated into an IOS NEUTRINO sounding rocket. An improved main valve unit was installed that increased the propellant flow, boosting the engine performance higher than was achieved during static ground tests. The rocket generated 10 Gs on takeoff with a thrust of 900-pounds and a specific impulse of 248-seconds. The test launch carried three commercial payloads: All were recovered with the rocket by parachute and came back alive and functioning. Boreal Space of NASA Ames Research Center flew its Wayfinder hosted payload technology that contained experiments from Stanford University’s Extreme Environments Lab, as well as a Graphene experiment from the University of Singapore. Masten Space Systems is a private company founded in 2004 by CTO David Masten. The company has 12 dedicated employees at its headquarters at the Mojave Air and Space Port. Masten’s focus on reusable rocket technology is driven by the goal of enabling space transportation and reliable planetary landers for the Earth, Moon, Mars and beyond. “We are a passionate company of inventors, creators and builders with goals that include landing our own vehicle on the moon in 2021,” said a company release. Masten competed in the NASA and Northrop Grumman Lunar Lander Challenge X Prize in 2009 with Xombie (model XA-0.1B). Xombie came away from the lunar lander challenge with an average landing accuracy of 6.3 inches qualifying it for Level One second prize of $150,000 on October 7th, 2009. The Xoie VTVL won the $1,000,000 Level Two prize of the Lunar Lander Challenge on Oct. 30, 2009 with an average landing accuracy of about 7.5 inches. Masten’s future vehicles have improved this performance and landing accuracy to provide EDL and testbed flight services to customers through NASA’s Flight Opportunities program. In November 2018, the company announced it had been awarded NASA’s Commercial Lunar Payload Services IDIQ contract vehicle to deliver payloads to the lunar service. CLPS is a multi-award contract worth $2.6 billion over the duration of its 10 year performance period. The contract funds launch, landing, and lunar surface systems with first missions targeted as early as 2021. 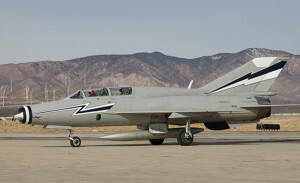 Vice President and Chief Operating Officer of the National Test Pilot School, Jim “JB” Brown, delivers a MiG-21UM to the Mojave Air and Space Port Jan. 17, 2018. The supersonic jet was purchased from Warbirds of Delaware in 2014; however, international sanctions against Russia delayed supplies needed to render the aircraft safe for flight. The National Test Pilot School is the only civilian test pilot school in the Unites States and is located at the Mojave Air and Space Port. It is organized as a not-for-profit education institute, and is one of the seven test pilot schools worldwide recognized by the international Society of Experimental Test Pilots, giving pilot graduates instant initial acceptance into the SETP. The other six schools are all military or military-sponsored schools. The National Test Pilot School was initially conceived to service the needs of aerospace manufacturers for qualified flight test pilots and flight test engineers. 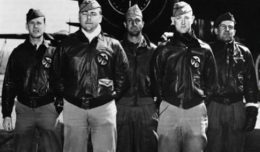 Prior to the formation of NTPS, aerospace manufacturers had only two options: to either hire ex-military personnel who had formal flight test training, or to use on-the-job training programs to develop in-house test pilots and engineers. 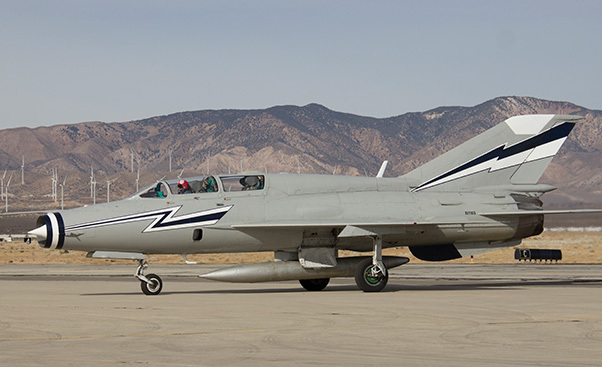 The National Test Pilot School offers the total flight test training and uses the finest flight test area in the United States, the R-2508 Complex that is also used by Edwards and China Lake. NTPS has modern facilities employing the latest technologies including specialized laboratories, simulators, ranges, and telemetry systems. Many of the more than thirty aircraft operated by NTPS are instrumented for flight test training, and no other school utilizes the variety of specially acquired aircraft to support flight test training. Flight simulators are used to bridge the gap between the classroom and the cockpit to allow students to explore, practice, and ask questions about flight test techniques before flying in the aircraft. NTPS has a diverse and extremely experienced staff of instructors. NTPS instructors come from the top test organizations in the United States and around the globe averaging more than 15 years of flight test experience and more than 10 years of flight test instructional experience. NTPS is the leader in innovative and customized total flight test training in the world. Scaled Composites is an American aerospace company founded by Burt Rutan and currently owned by Northrop Grumman that is located at the Mojave Air and Space Port. Founded in 1982 to develop experimental aircraft, the company now focuses on designing and developing concept craft and prototype fabrication processes for aircraft and other vehicles. It is known for unconventional designs, for its use of non-metal, composite materials, and for winning the Ansari X Prize with its experimental spacecraft, SpaceShipOne.